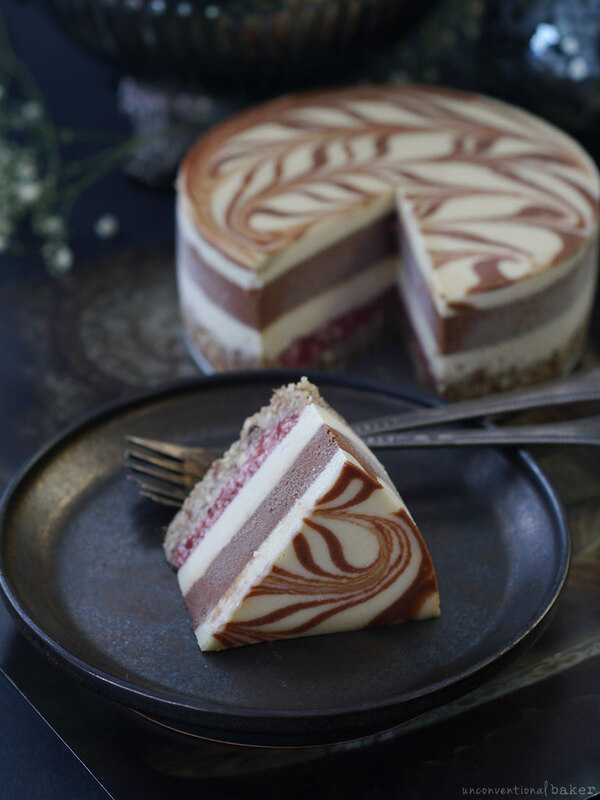 One layer of strawberry jam, a layer of chocolate, more layers of creamy white chocolate, plus a pretty swirl… and we’ve got the perfect little celebration cake. What are we celebrating? Oh, I don’t know.. life, a birthday, anniversary, a brunch, tea time, successfully making it through a day ?… Just kidding. 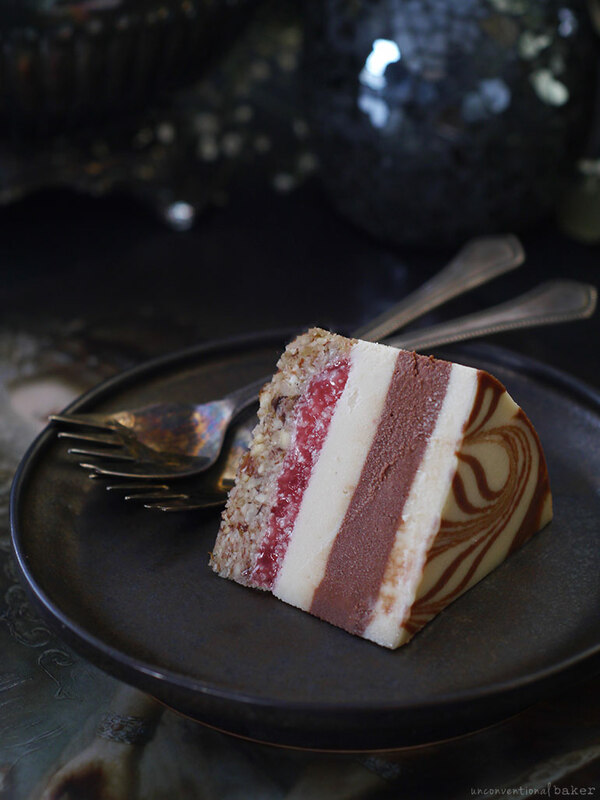 What I wanted to convey is that even though this cake looks a bit fancier than usual, it’s quite easy to assemble and fun to play around with, which makes it equally suited for occasions that require an elegant treat or something casually delicious. There are a few tips and tricks that will help you with this one though. Let’s start with the crust… See how it subtly curves towards the outer edge of the slice above? Take note! You’ll want to raise the edges just a tiny touch so that the jam layer can fit snugly inside the crust and not touch the actual rim of the cake. The reason for this is because that layer is more fragile, and a touch more delicate than the remaining layers, so you want it to be padded with the crust around the edges. Speaking of that jam… although this could very well be a raw cake in every way, I actually made it using a commercial fruit-sweetened jam instead because I had some to use up. Feel free to use a raw chia jam if you prefer. Also feel free to swap the jam flavor — the main thing is you’ll want the color of it to pop, so reds are a good choice here (think raspberry, strawberry, etc.). A bit of tartness is nice too, which is why I added a hint of lime juice, though it’s optional. Then there’s the swirl… this one is a bit tricky to explain how to do in writing, but it’s so easy a child could do it once you understand the steps. 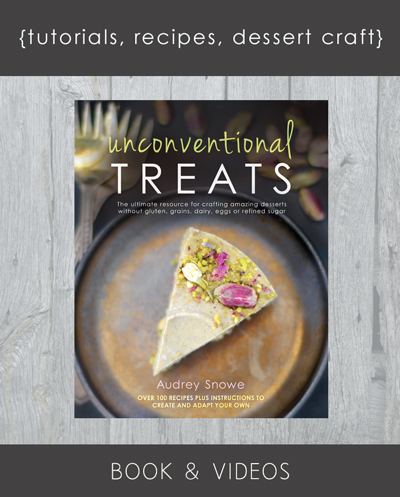 I tried to outline it as simply as I could in the notes to the recipe, but if you’re more of a visual learner and need more guidance, check out my book Unconventional Treats, especially the video tutorials — I show how to make this pattern and many others. Pinky swear it’s as easy as it comes and you’ll be able to make patisserie-style desserts to impress in no time. 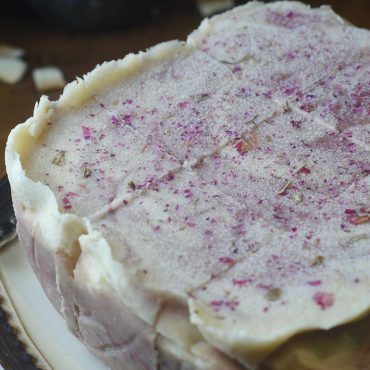 Same goes for working with cacao butter — there’s a whole chapter and video on how to work with it in there, how to pick the right one, etc., if you need more guidance. Last but not least, this recipe makes a small 5″ cake. If you want help multiplying this recipe for a larger cake, see the downloadable cake multiplication guide at the bottom of this post. 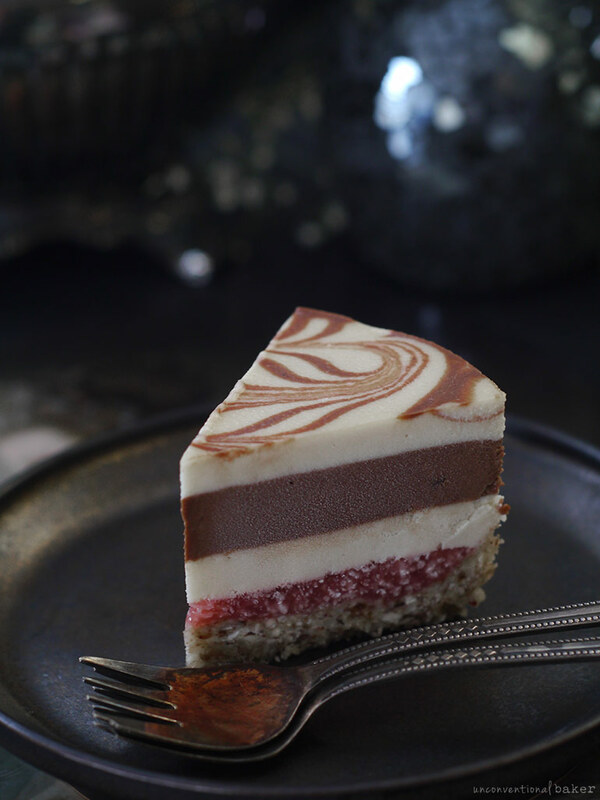 Layers of strawberry jam, chocolate, and white chocolate over a cashew crust make the most beautiful, delicious raw vegan cake. Gluten-free. Process all crust ingredients in a food processor. Transfer into a 5″ springform pan and press down into a flat crust along the base, and going a tiny touch up the sides. Freeze while working on next step. Place the jam and melted cacao butter in a small bowl and mix together thoroughly with a fork to combine. Spoon this jam mixture in an even layer inside the crust, keeping it a touch away from the walls of the pan. Freeze while working on next step. To make the filling, make sure all ingredients are at room temperature before starting. Blend all white layer ingredients in a high power blender until completely smooth. Pour just under half of this mixture into a little pitcher or small bowl and set aside. Add the chocolate layer ingredients to the remaining mixture in the blender and blend to combine. At this point draw out a little bit of this mixture (1-2 tbsp) into a cake icing pen (or spoon some into a piping bag), and set aside. To layer the cake, carefully spoon half of the white mixture over the jam layer in the cake pan. Tap the pan lightly on the counter to even the layer out. Freeze for 15 mins. Then carefully and evenly spoon the chocolate layer over the white layer, tap the pan lightly on the counter to even the layer out, and freeze for another 15 mins. Then carefully spoon the remaining white layer over the chocolate layer. Use the icing pen to create swirls or patterns of your choice (see notes*****). Freeze the cake for 5-6 hours (or overnight) to set. Remove from pan, thaw out 5-10 minutes, slice and enjoy! Keep leftovers frozen. *I used a commercial fruit-sweetened version (by St. Dalfour) but you can use a simple raw chia jam if you prefer. **To pre-soak nuts: place in a glass bowl, cover with water, and leave to soak for 4 hours (or overnight in the fridge). Then strain and discard the water. ***Note: I recommend going with alkalized cocoa powder over raw cacao powder for raw cakes, as sometimes raw cacao powder can react with other ingredients and spoil the cake. 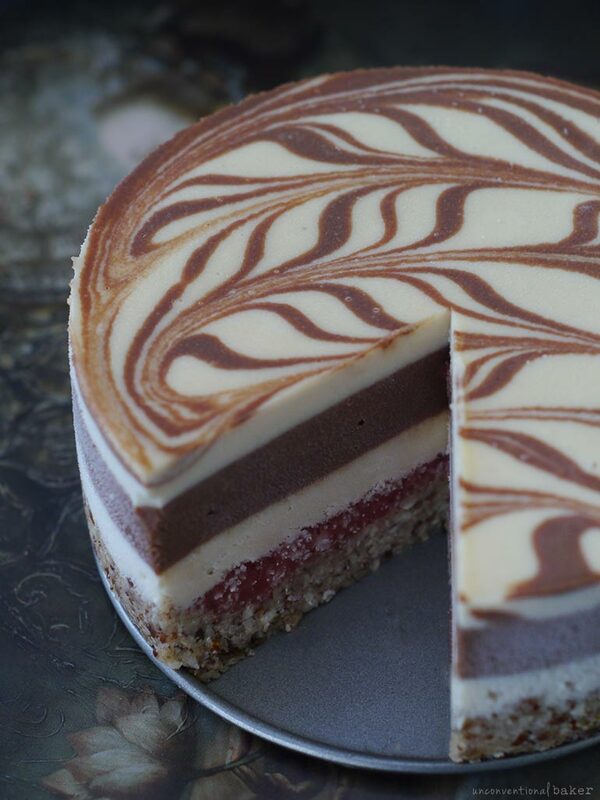 ****To create the pattern on top of the cake, draw vertical parallel lines on top of the cake (all going same way). Then use a skewer and drag it lightly over the cake going horizontally. Alternate the direction of the lines as you go along. If you’re a visual learner, there’s a video tutorial for how to do this pattern and many others in the Unconventional Treats video pack. This post contains affiliate links to the following products used to make it: cacao butter, fruit-sweetened strawberry jam, 5″ springform pan, and cake decorating pen. What could be substituted for the nuts in this recipe? Made this today with my 11 yr old son. Came out perfect! I was out of dates, so I subbed a dried apricot in the crust and it worked! That’s wonderful — so happy you and your son enjoyed it :) Thank you for sharing. I am 48 my health crisis first peeked its head six years ago and gradually went downhill and then speedily in the last two years. I was diagnosed with Lupus, Hypertension, Anemia, IBS and Hypothyroid…among a few easier dealt with conditions. That was 2months ago ..and I have been Hungry! WHY? …coz everything I found on Gluten free has eggs, and on Vegan sites has gluten….and the gluten and eggless sites use often use store bought premix flour which every single one has at least one ingredient I cant use. Everyone uses the words freely and I would spend hours to go through their material and found recipes with what they call “plain flour” which on their site suppose to be gluten free ?? and when I finally thought I found a blogger I can safely follow their recipes contain xanthan I cant use either…while the rest don’t seem like they have even tried the recipes ?? 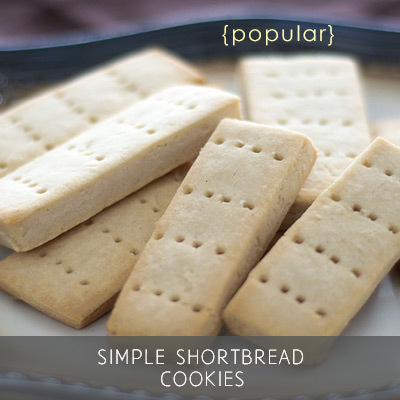 Hi – amazing recipes! My daughter is allergic to cashews (as well as dairy and eggs) but is ok with almonds. Can I make this and also the condensed milk recipe with almonds instead? In my experience almonds don’t blend down to the same flavor / consistency as cashews. Cashews have a mild sweet taste and are a much softer nut so they blend down into a smooth cream. 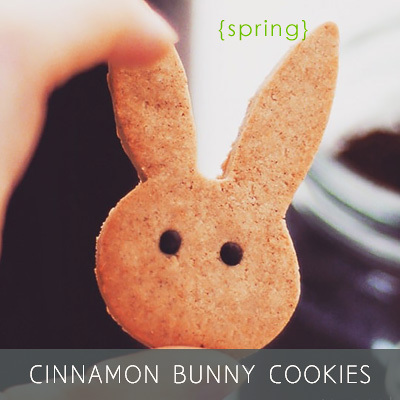 It’s more difficult to achieve that same consistency with almonds. That said, it’s still an option, but you’ll likely need to use more sweetener and perhaps modify the flavor a bit to account for the different taste of the almonds. Oh wowwie wow! Chocolate and jam are a fabulous combination. 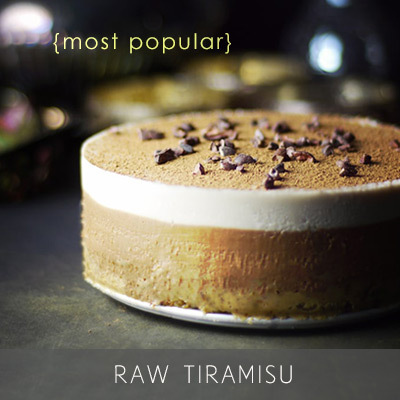 This raw cake looks absolutely gorgeous and delicious! 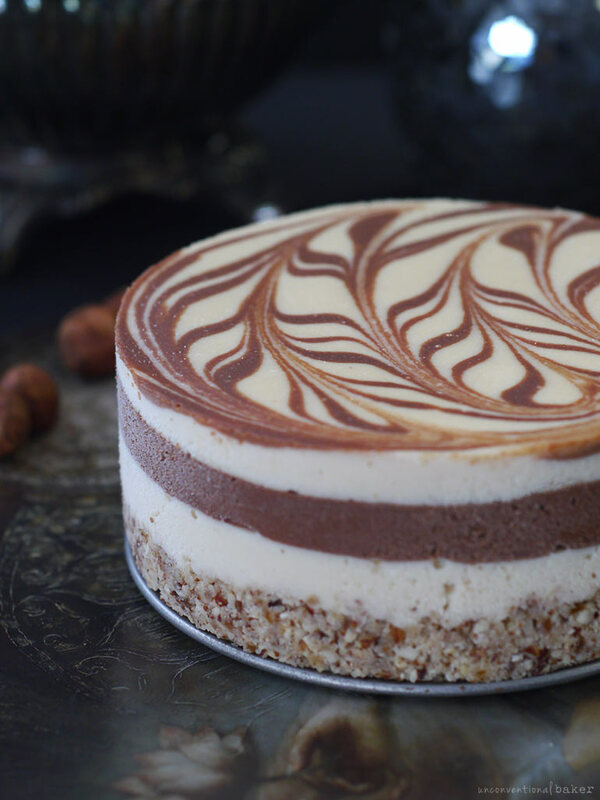 Lately I have been ADORING raw vegan cheesecakes, but I have yet to try making one of my own! Oo! Wow!! Want to make it right now!! Definitely yes for the crust — walnuts would be lovely. For the filling, you can use macadamia, but add a good amount of lime juice and more sweetener until the filling tastes right (I’ve tried a macadamia version of this and it turns out very different to the cashew version in flavor, hence the adjustment recommendations). Amazing, as always! 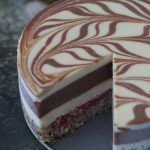 I am using cacao butter in all my raw cheesecakes now and it creates the most amazing texture, not to mention the cake doesn’t melt at room temperature! I always use cacao powder rather than cocoa powder in all recipes. I have never had any weird reactions. I’m curious, are there specific ingredients that react with cacao? About the reactions, here’s the deal: it’s just my theory at this stage. It’s pretty rare (and I use raw cacao powder sometimes still in cakes) and more often than not you’re ok to go with raw cacao powder, but I’ve had it react with coconut, mulberries, oats, as well as the actual pan on separate occasions. It might also be something unknown it’s reacting with (for example some undeclared or unknown additive in one of the ingredients I mentioned above). 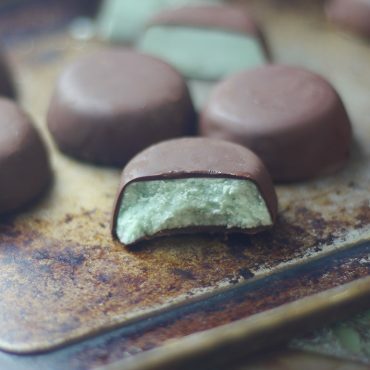 After multiple experiences like this and some experimenting, I felt like it’s “safer” to just go with alkalized for raw cakes (I still use raw cacao for everything else). Some of my readers reported the same (and unfortunately had birthday cakes spoiled as a result). Raw cacao is acidic by nature and therefore reactive (that’s why it gets alkalized for traditional baking, to reduce the reaction and have more control over the reaction within the recipe with other things like baking soda + lemon, etc.). I’ve tried to experiment a lot to really narrow it down with this, but it’s a hit and miss so far. I don’t want to have people following the blog take chances so to keep it safer alkalized (which is neutralized cacao) is a safer way to go to avoid any unexpected last minute surprises. The reaction itself, when it happens, makes the cake be completely inedible — it makes it taste like a metallic chemical, and I believe it’s not safe for consumption at that point (the flavor is similar to that of something that absorbed leached minerals from a pan — which is something that can happen if you soak something in lemon juice in a lemon pan for example). When you make the batter it’s totally fine, it only turns like this after setting for a few hours. By the way, when I said “with coconut” above — I’ve never had that reaction with coconut oil, only when I added shredded coconut or coconut milk into a recipe. And definitely never with cacao butter (those two separated parts of the same source, so don’t think they’d ever react :) ). Hope that makes sense and I hope I didn’t confuse you with all this stuff ? Has anything like that ever happen to you? So the reaction only happens when you are adding liquid to create a “batter”? Not with raw cookies, brownies, bars, etc? Yeah, that’s right. It’s only happened to me with raw cakes specifically, and usually mainly in the filling. It’s also only once it sets, so after hours (initially the filling tastes great as usual). I’ve never had that happen with any other types of raw goodies (cookies, balls, etc. ), and I always use raw cacao for things like nice cream, sauces, etc. Always fine. So it seems something occurs between filling ingredients (main culprits I’ve experienced this with described above) + sitting in a metal pan for some time? Wait, how did I find myself in this science lab?! I thought I was just making cakes! ? Hehe, thanks Natalie. There’s always something to celebrate in life ? Looks fabulous…like a European pastry. Very impressive! I’ve pinned it.